This is an absolutely stunning image. Well done, indeed! That's gorgeous! Very nicely done! What are you using for an Ha filter? I was out shooting the Bubble nebula a couple of weeks ago and really wanted an Ha filter to let me gather a lot more Ha data without gathering all the light pollution. I have a number of filters in my bag... but I haven't yet picked up one for Ha. Thank you. I've missed getting to image. The narrowbad filters are letting me shoot from home with bad LP, so I'm getting to do some processing again. I use Astronomik 12nm clip-in. I also have the 6nm Ha but I have not used it much. I used the 12nm Ha and OIII the other night with a 99% Moon and combined them with a synthetic green with good results. I am just learning to use Ha and OIII in my imaging process, but I like them. My 60D does have a has a full mod so it lets the red in well. This is a Spectacular shot! Wow!!! Just Wow!!!! This is an absolutely stunning photo!!!!! Canon Powershot S95, Canon EOS 1000D attached to Skywatcher Explorer 150P on an EQ-3 unguided mount. Excellent detail sir! If you do not mind me asking, how are you combining you Ha with the RGB? 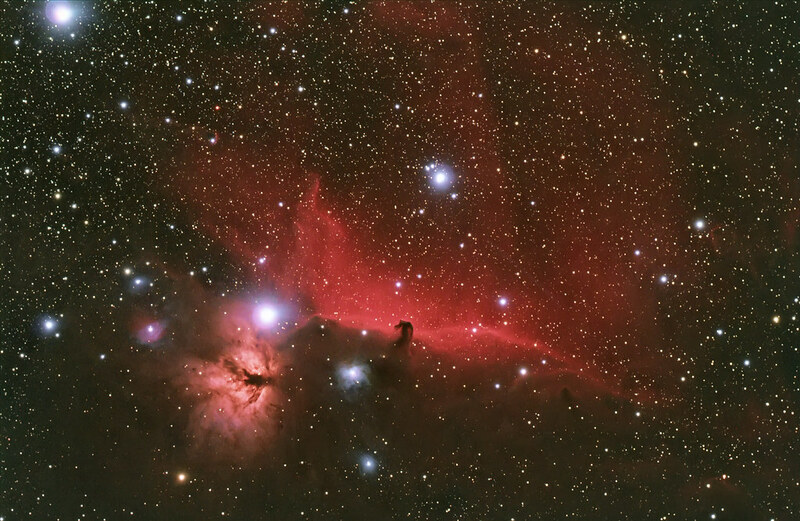 I am working on a widefield of Orion myself using various method with Pixinght with mixed results. Naddieuk, I'm using a dual scope setup so I have 2 sets of images Ha form the Modded 60D and RGB from the 60Da. In DSS I use a frame from the 60Da as a reference in both stacks so they are aligned by DSS and easy to combine in PS. I use PS6 and combine the Red channels from the RGB and Ha to get a RGBHa. I usually go back and use the Ha to add some luminance. I'll add a link if I can find it. It gives a good combination method. Hopefully something like it can be used in PIX. It has taken me a lot of playing around to get the results I want when combining. But the method below works very well. Found it. I hope this helps.